Maybe more than any other smartwatch company out there, Samsung's had the chance to really refine its approach to wearables. It got started early enough that we've already seen several generations of hardware go by, and the products that have emerged over the years have shown us varying approaches to design, feature sets, and even the software powering these devices. So where does it go from here? To hear a report from earlier this week, “not back to Android Wear,” as Samsung executives reportedly confirmed plans to steer clear of Google's platform for upcoming wearables. But now Samsung's speaking out against those claims, but with a choice of language that only leaves us with more questions. Samsung, as you may recall, has so far only released a single Android Wear smartwatch: 2014's Gear Live. Sure, the original Galaxy Gear ran Android before being updated to Tizen, but that pre-dated Android Wear. 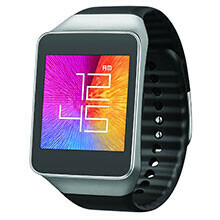 Since the Gear Live, though, Samsung's wearable efforts have been Tizen-only. With us seeing so little visible Samsung interest in Android Wear, the idea that the company might be done with it for good wasn't hard at all to believe. Is that really a rejection of this no-more-Android-Wear story? Well, the way we heard it Samsung never made a formal announcement at all; the source was what sounded like a private comment made by a couple company executives. And as for not changing its level of commitment to Android Wear – well, was Samsung really that committed to begin with? As we've pointed out, its track record has been leaning strongly in the direction of Tizen, so an abandonment of Android Wear doesn't really feel like any sort of change at all. All this has us curious what Samsung's really up to with its wearables. Why would the company comment at all if its future smartwatches really will be a pure-Tizen lineup? Could there be a Gear Live 2 somewhere in development? For now, we're just not sure what to think. You make and sell more Android phones even though you also sell Tizen phones as well. I think Samsung wants more control over its smart watches. Where as Google controls and updates Android Wear. It's different on phones and tablets, because any OEM can add anything they want to Android there, but that's not the case for Android Wear. Besides that Samsung should be looking at making more Android Wear devices, because Android Wear has a lot more apps than their Tizen watch platform.